The Kansas City, Kansas Public Schools’ Board of Education heard a report on the student assessment projections. The state of Kansas provides three separate interim tests during the school year to predict performance on the state assessment. By the time students participated in all three interims, they were exposed to all of the skills on the test. These tests were taken in mid-October, mid-December and late February. Students are undergoing the assessments in April. Click here for an explanation of the data from David Rand. Malik Abdi, Pre-K student at Morse Early Childhood Center: Malik deserves this award because he always has a positive attitude and looks out for his friends. There are several moments that really stand out that highlight his friendly attitude. One day he brought special chips for lunch and his friend wants some, but the teacher told him not to share because Malik’s parents packed that snack just for him and it might spread germs to share one bag. The next day Malik came to school with two bags of chips, so his friend could have some. It made his friend’s day and demonstrated a lot of thought for a four-year-old. Arriyana Bray, 5th Grader at John F. Kennedy Elementary: Arriyana Bray makes J.F.K. Elementary feel good about the excellent goals that have been set up for each student. Her personality, smile, friendliness and goals make her really stand out. She has become a role model for her fellow students and a true leader and positive role model. Arriyana has been helping in the cafeteria during breakfast since the beginning of the school year. She is also a technology leader. Currently, she is working on a song for Fuel Up to Play 60, as music is another one of her talents. 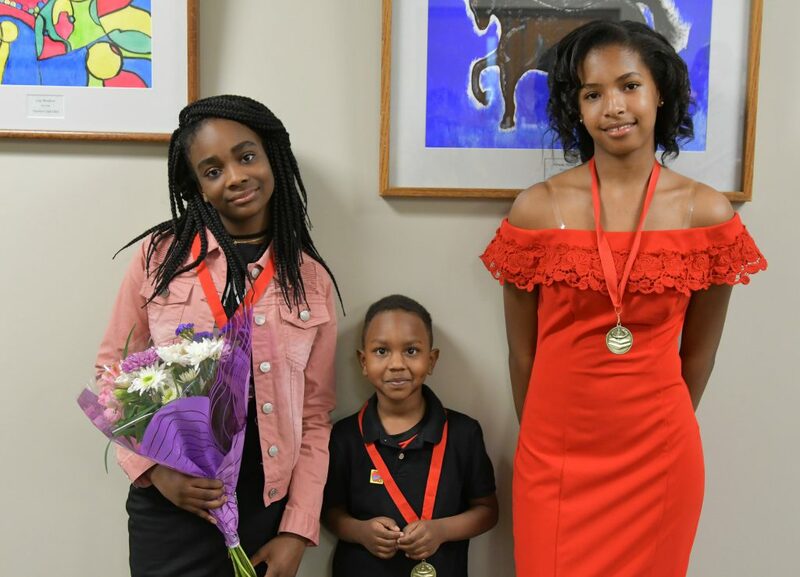 Victoria Netherland, 8th Grader at West Middle School: Victoria is extremely focused and has attended the straight A’s luncheon throughout her time at West. She participated in the “straight A’s” luncheon and has received straight A’s her 6th, 7th and 8th grade years. She has been on the Superintendents Honor Roll for all the years she has been at West. She is also in Honor Choir, Voice of Change, and in the Poetry Club. Victoria is part of our volleyball and track team as well. 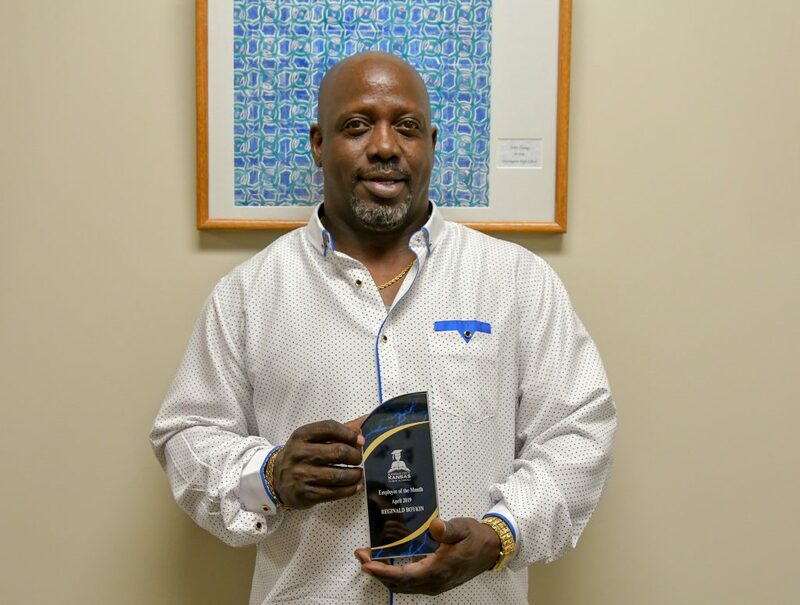 Reginal Boykin Labor and Grounds Crew: My name is Tennille Nelson, and I am a teacher at Whittier Elementary. On the morning of Friday, February 8, my van was stuck sideways on a narrow icy hill by Noble Prentis. I called my husband to come help, but he couldn’t do much by himself and I had to keep my foot on the brake because even when placed in park the van was slowly sliding down sideways. Just when we were thinking about calling for a tow-truck, we saw a KCKPS truck drive by at the top of the hill. My husband and I waved the truck down. The driver saw us and immediately stopped and got out to see if he could help. After slipping and sliding down the hill to my van, Kiki and my husband were able to push the back end of my van enough to get me straightened out so I could roll back down the hill safely. He truly saved the day! KCAL Winter Sports Winners were also honored. Click here to see their photos. Congratulations to all of those recognized at the meeting. To see more from the Board meeting, click here. The Kansas City, Kansas Public Schools is governed by a seven-member body of citizens elected by the voters of the school district. These seven members are charged with making sure that the school district operates in the best interests of the students and the community. All members serve without pay. The board of education is the school district’s governing body, as set forth in state and federal law. The board is responsible for setting district policy, adopting an annual budget, and approving of general district matters, including personnel, curriculum, facilities, and other district business matters. The board is responsible for hiring the superintendent of schools, and is responsible for overseeing the superintendent’s duties and performance. 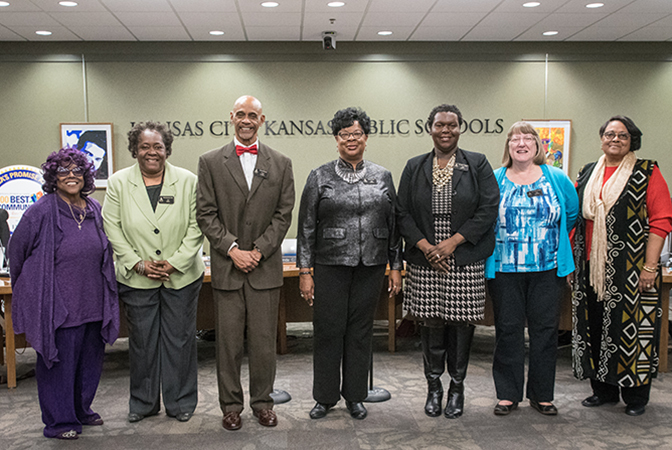 Board of education meetings are normally held the second and fourth Tuesdays of every month at 5:00 p.m. in the third floor Board Room at the Kansas City, Kansas Public Schools Central Office and Training Center, 2010 N. 59th Street. This year, several Board meetings are scheduled out in schools. The entire board meeting schedule can be found in the right submenu — “Meeting Calendar”. Except as otherwise provided by law, all meetings for the conduct of the affairs of and the transaction of business by the Board of Education of the Kansas City, Kansas Public Schools shall be open to the public. Those wishing to speak about a policy-related issue at a Board of Education meeting must make their request to the Board Clerk no later than noon the day prior to the Board meeting. During the Community Comment section near the beginning of the meeting, each speaker will have three minutes to address the Board about policy-related matters. Derogatory or critical remarks about specific district personnel or students are inappropriate and will not be permitted. If a speaker wishes to discuss a topic which is on the meeting agenda, the speaker’s comments will be deferred until that item is considered.